বিদেশে নির্বাসিত অবস্থায় থেকেও আমরা কিন্তু এ সম্পর্কে অনেক কিছুই জানতে পারছিলাম বিভিন্ন সূত্র থেকে। জিয়ার পায়ের নিচ থেকে অতিদ্রুত মাটি সরে যাচ্ছে সেটা পরিষ্কার হয়ে উঠেছিল আমাদের কাছে। দেশের ঈশান কোণে অশনি শংকেত, আর জেনারেল জিয়া তখন সারা বিশ্বে তার ভাবমূর্তি বাড়াবার প্রয়াসে ব্যস্ত! ইতিমধ্যে বেশ কয়েকটি সামরিক, বেসামরিক, রাজনৈতিক এবং সাংস্কৃতিক ডেলিগেশন গণচীন সফর করে গেছে। এখনও আসছে যাচ্ছে। সেই সব ডেলিগেশনে পূর্বপরিচিত বিশ্বস্ত আস্থাভাজন সহযোদ্ধা এবং বন্ধুরাও আসছেন যাচ্ছেন। তারাও জানিয়ে যাচ্ছিলেন ভেতরের অনেক গোপন খবরাখবর। সবারই প্রায় একই কথা জিয়ার দিন ফুরিয়ে আসছে। ব্যক্তি হিসাবে জিয়ার পরিণাম কি হবে, ক্ষমতায় থাকবেন না ক্ষমতাচ্যুত হবেন সেটা আমাদের কাছে বিবেচ্য বিষয় নয়। আমাদের ভাবনা ছিল জিয়ার তিরোধানের পর দেশের রাজনৈতিক মূলধারা কোন পথে অগ্রসর হবে! স্বাধীনতা এবং জাতীয় স্বকীয়তা টিকিয়ে রাখা সম্ভব হবে কি না! দেশটিকে অঙ্গরাজ্যে কিংবা করদ রাজ্যে পরিণত করবে নাতো আগ্রাসী ভারত ১৯৪৭ সালে ‘ভারত মাতার’ অঙ্গচ্ছেদ ঘটানোর প্রক্রিয়াতে বাংলাদেশী মুসলমানরা যে অগ্রণী ভূমিকা পালন করেছিলো তার প্রতিশোধ নেবার জন্য! Though leading exiled life we came to know a lot about this from various sources. Gen. Zia was loosing his ground fast that become clear to us. An ominus dark cloud was hovering in the sky of Bangladesh! But surprisingly, Gen Zia then was busy with his foreign trips to enhance his immage around the Globe! Mean while quite a few military, civilian and cultural deligations had visited People’s Republic of China. Still they were coming and going. Many trusted friends, personale and co-revolutionaries are also coming as the member of the deligations. They were also aprising about the depressing precarious uncertinity that was prevailing in the country. Some were revealing many inner secret information with confidence. Most had said one thing in common, ‘Zia’s days were numbered’.As an individual whether Zia would remain in power or not or what is going tobe his fate that was not our concern. Our concern was in which direction the main syream of national politics would be flowing in future in the post Zia erra. Whether it would be possible to maintain our national self identy or not. What the expansionist India would be doing taking the oppurtunity of internal caos and instability? Will it annex Bangladesh like Sikkim? Most likely not as in that case they have to take the liability to feed 8 Cores of Muslims. Besides, this homogenious entity might create political problems within India itself which was already engaged in fighting out independence movements waged by the distictly different ethnic minorities defying Indian Union. Therefore, most likely Bangladesh would be turned into a client state like Nepal and Bhutan to take revenge on the majority Muslim population of this region who had played the vanguard role in dissecting ‘Varat Mata’ to establish a separete home land for the Muslims called Islamic Republic of Pakistan in 1947? 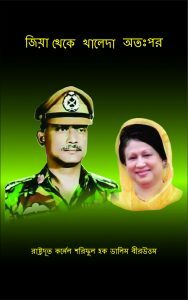 Ultimately if Bangladesh’s fate becomes like that of Nepal or Bhutan then how we as the commanders who had inspired scores of freedom fighters with dream to build a such a Bangladesh where fruits of the independence would be reaching every door step. Uncounted freedom fighters being imbued with that spirit had embressed martyrdom having that cherished dream in their heart! If that dream gets lost and we remain inactive then what answer shall we give to Allah and those departed souls? This became a vital moral question for us. Facing some problem with food we shifted to near by Shin Chao hotel. This was the second high class hotel in Piking at that time. This hotel has a special heritage. When the leaders of the Chinese communist pary comes to Piking they are loged here. The foreign political deligates are also kept here. Besides, revolutionary exiled leaders from many countries are also living here for long as the honered guest of Chinese government. Therefore, ordinary foreign guests are not allowed to live here. Resident diplomats are carefully veted before they can visit this hotel. Nimmi and I were perhaps the only exception. Why the Chinese authorities permitted us to stay here? The only answer could be trustworthiness. They might have known that I was not an professional diplomat like others. The Chinese authorities used to view me differently that proof I had already got. At that time any diplomat who desired to travel outside 40 Km radious then special permission was needed and the diplomat’s travel used to be organized by the concerned Chinese authorities. But they were very generous in my case. Whenever I wished to visit any place with Nimmi they arranged the visit lavishly as a special visitor. Not only that they used to provide a veteran person well versed with Chinese history and astute interpreter. At that time they didn’t even object if I wanted to visit sensitive provinces like Yunan, Uighar, Xin Chiyang, Tibet etc. During my stay there was a unfortunate short war between China and Mongolia at the border in the valley of Amur river basin fanned by earstwhile USSR. After the war I desired to visit the site and the Chinese had agreed. The Chinese authorities knew that alongside my diplomatic responsibilities I was also carrying out analytical study on the history of China and Chinese revolution, state structure of the new Republic of China, transformation of the social structure and advancement in other fields to understand the present and future of People’s Republic of China. When I arrived China was passing through a critical juncture. The capitalist West even the USSR were trying heart and soul to create an iron curtain around China so that it remains weak. They unitedly even were trying how to disintrigate China. But The tested Chinese leadership projecting their selfless dedication, self confidence, morality, vision, heritage, lesson of the history and far sightedness could unite the people to undo all conspiratorial designs and cobweb of the enemies and had been proceeding uncompromisingly in their stride to achieve their goal step by step at an unbelievable speed!From then till now, this forward mach couldn’t be stopped by any foreign powers. In the days when China was within the iron curtain for security reason all the foreign Missions had to hire local staffs fron one of the Chinese organisation. Efficient and expert individuals used to be sent as required. But it was never been possible to know their real identity and position. There is no doubt, that these functionaries used to be the sources for gathering information for the concerned Chinese authorities about the resident Missions. We were still residing at Xin Chao hotel, when an unforgettable dreadfull hair raising Earthquake occured.